Hence we know that there are many techniques for Facebook Account hacking like Phishing Attacks, Keylogging and other Social techniques but today we are going to see how to hack passwords using new feature introduced by Facebook the 3 Trusted Friends Password Recovery Feature in this what happens if you have lost your password and you don’t have any access to your default email address than this feature will handy by sending request to your 3 trusted friends and hence gaining your account password again. For this technique you need to create 3 fake Facebook account and you need to surely add these as friends into your victims account whose account you are going to hack. 1. Go to Facebook and click Forgot your Password ? 2. Than you will get something like below just enter the details you know about him enter his Username, email address and full name. 3. After entering everything check it again and click on search. No Longer Access to These click that one. 5. Now it will promote you to enter a new email address on which you will get the password resetting option so enter your email address I suggest you creating a Fake or Temporary email address for safety purpose. 6. Than it will promote you to enter the Security well if you have some security guess about that one than that’s ok but if you don’t know it than simply enter 3 wrong answers and it will take you to the 3 trusted friends recovery page like below. 7. Now just click continue and facebook will ask you to choose 3 trusted friends choose the 3 fake profiles of your which you created and added into the victims account. That’s it now you are successful in Hacking Facebook Password with the 3 Trusted Friends Method. 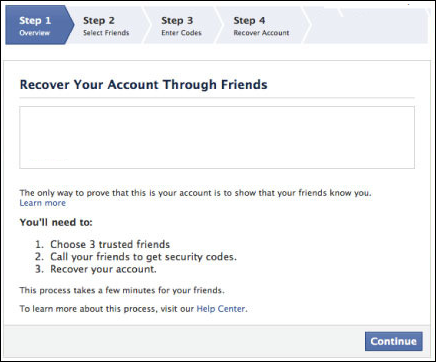 Note: This trick only works if 3 trusted friends agree to give you the security code so its really important that you add your 3 fake accounts into your victims facebook account as a friend.